Castle Rock comes with some impressive names attached both behind and in front of the camera and it sets things off with an ominous first episode, based on the prolific work of “the king of horror” Stephen King. J.J. Abrams is a co-executive producer and a formidable cast includes Sissy Spacek, André Holland, Scott Glenn, Terry O’Quinn, Frances Conroy, Melanie Lynskey, Bill Skarsgård, Jane Levy, Allison Tolman and more. Even the score is penned by Thomas Newman. Castle Rock is small-town USA in Maine, but one that is down on its luck. There are dilapidated buildings, a weary working-class community and a nearby prison, the (King-created) Shawshank State Penitentiary. The series opens with two striking scene: one sees Sheriff Alan Pangborn (Scott Glenn) tracking down a lost boy in the snowy woods in 1991; the other involves the dramatic suicide of Shawshank’s warden (Terry O’Quinn). But you just know being a King tale that somehow the two will be linked….. Meanwhile Shawshank’s new warden (Ann Cusack) is determined to make her mark and wants to reopen an old wing which hasn’t been used in 30 years. There guard Dennis Zalewski (Noel Fisher) discovers a timid young man hiding out, which prompts him to call lawyer Henry Deaver (André Holland) who is known for profile cases, and has a history with the town. To reveal much more than this would risk ruining the opening chapter for you, suffice to say that it is Henry Deaver who emerges as the through-line in a complex set-up. 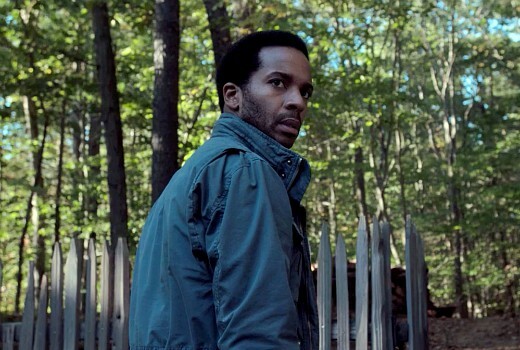 In this key role, André Holland proves obstinate and seemingly ignoring significant events from his past. Many of the marquee names such as Scott Glenn, Frances Conroy, Allison Tolman, Rory Culkin, Ann Cusack and Terry O’Quinn are supporting players although Sissy Spacek is always wonderful to watch, here as a mother battling dementia. Director Michael Uppendahl sets the creepy tone of the piece well, rippling it with just enough to unsettle the viewer without resorting to B-grade horror tropes. It’s hard not to sense that something spooky (either supernatural or paranormal) has affected the whole area of Castle Rock and it citizens are playing out an endgame they have no control over. Look forward to finding out more over its run of 10 episodes, and then a second season approved for 2019. Castle Rock airs 8:30pm Mondays on FOX Showcase. Recorded this for the weekend. Always been interested. I thought the opening episode was indeed a genuine 4 stars. The 2nd episode didn’t do as much for me, but that’s to be expected when establishing a whole smorgasbord of characters. I really wish that U.S series would learn from their U.K counterparts… If a show doesn’t have enough steam for 10 episodes, then there’s nothing wrong with making it 6 or 8. I agree. I think it was about episode 5 that the frustration set in as the story became less concise and a little confusing. Agree as well. Lost momentum about ep 7. Is there a dome involved? That’s about the only King cliche they did didn’t tap, perhaps CBS still own the rights to that one. It’s basically a game of spot the references for obsessive King fans. I understand some of them but not enough for it to make any sense as a story. It’s Just fragments cobbled together, with uninteresting characters in the style of King, with predictable direction and cringe worthy dialogue.